Vĕra Čáslavská, Olympic hero, gymnastic innovator and national icon of resistance to totalitarianism has died in her home town of Prague, Czech Republic at the age of 74. Competing for the then Czechoslovakia, the peerless gymnast who introduced a dynamic athleticism into her sport won seven Olympic gold medals and four silvers, four world titles, plus five silvers and a bronze; and no fewer than 11 European golds. In one heady period, 1964-68, spanning the Olympic Games of Tokyo and Mexico City, she won double the number of titles of all her great rivals, the Soviet women gymnasts, combined. While she was a radiant personality on the bars, beams and mat, Čáslavská was a retiring person in public life. She did not seek the limelight. 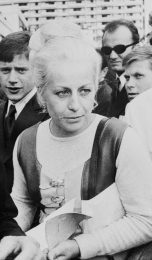 Nevertheless, her public support earlier in 1968 for the new First Secretary Alexander Dubček and the liberalising movement known as the Prague Spring meant she was already a marked woman; and when she signed the 2000 Words Manifesto, emphasising her further support for change, her preparation for the Games was compromised. After the Warsaw Pact invasion in late August, She was advised to get out of Prague for the six weeks prior to the Games in Mexico, and famously completed her preparation by training on five-barred gates and bales of hay out in the countryside. Like the rest of the Czechoslovak Olympic squad, she only learned at the last minute that they would go to Mexico. But once there, she made her mark as indelibly as the 200 metres gold and bronze medallists, Tommie Smith and John Carlos, when they raised their black-gloved hands, to protest racism, during the playing of the US anthem. My greatest regret, during researches into my recent book on her Olympic colleague, Emil Zátopek was that I was not able to interview Čáslavská, apart from a brief phone conversation 18 months ago. Because, unlike Zátopek, Čáslavská never renounced her signing of the 2000 Words Manifesto nor her support for Dubček. During our chat on the phone, she indicated that she was too ill to see me, and that I should talk to her biographer, Pavel Kosatík. In his biography Věra Čáslavská, Life on Olympus, political historian Kosatík writes about Mexico, ‘When Věra bumped into Russian athletes in the Olympic village they ignored each other. The atmosphere in the gymnastics auditorium surrounding the Czechoslovak and Soviet teams was so intense that Věra went on to say that it felt more like she was in a bullfighting ring than at the top gymnastics competition. But there was no doubt that it was Věra who the audience was cheering for. In Mexico, Věra had been declared the second most popular woman on the planet after Jackie Kennedy….. huge political importance was now attached to sporting victories.  Beating the Russians in sport was the only method of victory still available to the Czechoslovaks. By turning her head away from the Soviet flag, Věra could not have fulfilled this task any better’. In normal circumstances, Čáslavská would have been fêted when she returned home to Prague, given awards and the coaching post that she expected, even demanded on occasion. But in what was called ‘normalization’ circumstances, she was ostracised for the better part of two decades. 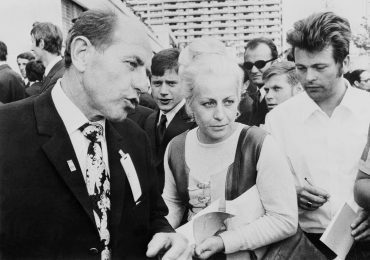 Like with Zátopek – who had gone out on the streets of Prague to denounce the Russians in 1968 – the authorities reluctantly allowed her to go without spouse to the Olympic Games in Munich 1972 when, Kosatík records, she was centre screen on Czechoslovak TV on at least one occasion, with commentators remaining mute. Finally, in 1979, she was permitted to take up a coaching post in Mexico, where she was still idolised, but even that seemed to require pressure from the Mexicans over oil exports. She stayed two years, during which time her marriage to Odložil foundered, and they were divorced in the mid-1980s, almost concurrent with a visit to Prague by the IOC president Juan-Antonio Samaranch, who surprised his hosts by belying his own totalitarian background – he had been a supporter of the Franco dictatorship – and insisted on not only meeting Čáslavská and Zátopek publicly, but awarding them the Olympic Order. Following the Velvet Revolution, when both she and Zátopek were restored to public life, she became one of only two women to join the inner-circle of playright- President Václav Havel at Hradcaný Castle. But her life was short-circuited again in 1993, when her ex-husband Josef and their son Martin got into a fight in a Prague nightclub, and Josef died from a head wound. Martin was jailed but got a reprieve from Havel four years later. Sections of the media blamed his pardon on favouritism, due to Čáslavská’s fame and proximity to the President. She withdrew again from public life, and only emerged in recent years to accept a plethora of awards, both national and international. They should have come years if not decades earlier. But they did, finally come in time. Čáslavská had been suffering from pancreatic cancer for over a year, and died on August 30, 2016. She was a heroine to me since I first saw her compete and protest on TV. She inspired me because she worked hard, won and was FEARLESS. I tried to emulate her in many ways, even wearing my hair in a bun like hers when I ran. She never gave up, and now her spirit will continue to inspire us.